There was an estimated 8 million pounds of guacamole eaten on Super Bowl Sunday this year, and the majority of that came from Mexico, as it has a stronghold on the avocado market in the U.S. But, another Latin country is setting new records in avocado export value. 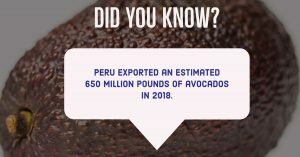 According to the Lima Chamber of Commerce, Peruvian avocados export grew 26% in 2018 to set a record of $800 million. Comparatively speaking, in 2008 Peruvian avocado exports amounted to only $84.4 million. The avocados were shipped to 35 different destinations, with the top three being Netherlands $275 million, the U.S. $191 million, and Spain with $111 million. In addition to staring to export to 10 new markets since 2008. Expectations will be similar in 2019 for Peru, who last year exported 335,000 tons of Hass avocado during its season, which usually runs from Memorial Day to Labor Day. Two other notable mentions within Latin America are Colombia and the Dominican Republic both exceeding avocado export growth in comparison to their original forecasts.